When Andrea Riccardi, Minister of Integration and International Cooperation of the Italian Government, invited me to join the Commission for “Religions, Culture, and Integration” in 2012, I did not know how to connect the experience of interreligious dialogue with the challenges of migrants and refugees in Italy. In fact, I was afraid that the discussion of respect for religious doctrines had become conflated with immigration issues in Europe. Two years later, the Ministry of Social Policy involved me in another interreligious commission, which would primarily deal with racist and gender-based discrimination. In 2015, I first met with Jesuit Refugee Service and Centro Astalli in Rome. It was only then that I began to focus on interfaith cooperation in support of the dignity of migrants and refugees. I remember my first encounter with Thomas H. Smolich SJ (International Director), Aloysious Mowe SJ (current International Director of Advocacy and Communications), and Amaya Valcarcel (International Advocacy Coordinator) at JRS’s headquarters. My engagement with them inculcated a common understanding of the importance of brotherhood in action: to act together for the respect and dignity of all. Later, I attended a presentation at the Gregorian University about the activities of Centro Astalli given by Camillo Ripamonti SJ (President) and Chiara Peri (Policy and Advocacy Coordinator) in collaboration with Cardinal Francesco Montenegro—then Monsignor and President of Caritas Italy. It was another enlightening encounter with a discussion on fighting ignorance and injustice, faith, charity, prayer, and fraternity. Some question what the Islamic world’s institutions are doing for Muslim migrants and refugees, others instigate false narratives of Islam in Europe and radicalism. 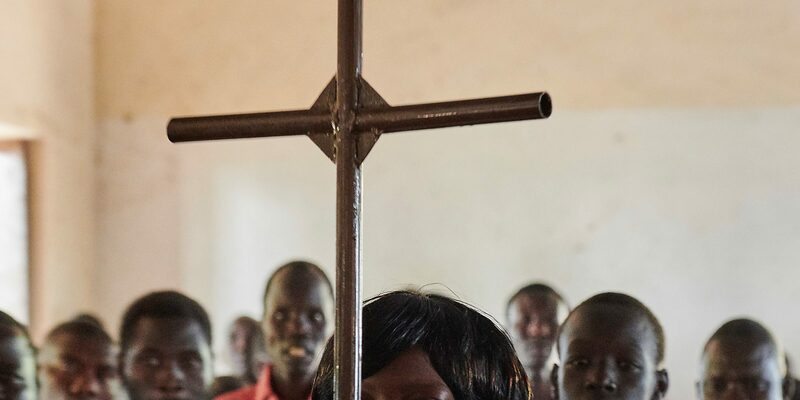 The Italian organization COREIS (Comunità Religiosa Islamica) along with JRS shared a joint statement during the Jubilee of Mercy that expressed a common concern for the respect of all migrants and refugees. I presented our statement at the September 2016 United Nations Assembly in New York in a shared delegation with the Secretary of State of the Holy See, Cardinal Pietro Parolin. In 2017, COREIS and JRS shared a statement that offered interreligious intervention in favor of bridges and not walls, addressed to the administration of President Donald Trump and his policies against immigration. 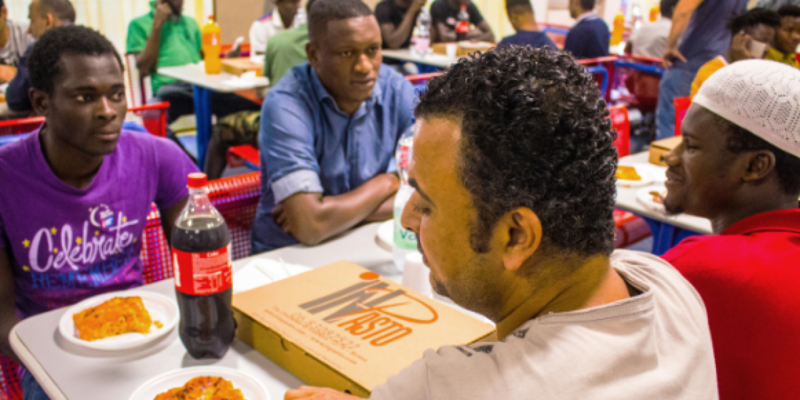 This year during the month of Ramadan, COREIS collaborated with Centro Astalli and JRS to inaugurate a program called 114 Pizza and Sweets in urban centers in Palermo, Vicenza, and Rome. The project was offered to migrants and refugees in 21 events for over 3,000 people. It was particularly moving to see young refugees rediscovering the sound of the call to prayer (adhan); sharing the simplicity of Italian cuisine; acknowledging the beauty of Ramadan with our brothers and sisters of various cultures and religions; and listening to the harmony of the recitation of the Quran. We met women, men, and children from Sudan, Mali, Nigeria, Burkina Faso, Ivory Coast, Egypt, Morocco, Senegal, Afghanistan, and Somalia. I heard extraordinary stories, and together we observed powerful moments of silence. We shared all of this with Cardinal Peter Turkson of the Dicastery for Promoting Integral Human Development. In a video recorded for their site, I expressed my satisfaction with our interreligious cooperation, which allows everyone to discover the value of the other along with work done in the name of God, and our common good in the common house.